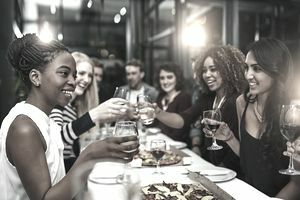 There are many different ways to promote a restaurant including holidays, like Valentine’s Day and New Year’s Eve to nightly promotions such as happy hour. Other promotions include tasting dinners, restaurant week, nightly dinner specials and customer appreciation promotions. One of the biggest nights of the year for a restaurant, New Year’s Eve brings groups of people out for a night of fun. Think appetizers, buffets of party food, and champagne. Unlike New Year’s Eve, Valentine’s Day is all about couples and romance. Think specials for two, paired with wine, decadent desserts that can be shared. Busy days like Mother’s Day offer restaurants a chance to increase sales and bring in future business with word of mouth advertising. However, common mistakes often lead to Mother’s Day blunders that could potentially harm a restaurant’s reputation. Many restaurants with a bar or pub offer happy hour specials during the week. Happy hours are geared toward working people, to entice them to stop in for a drink special after work. Along with cheap drink specials, many restaurants offer inexpensive or free appetizers such as chicken wings, taco bars, or chips and salsa for patrons. Established in 1992 to help increase business for restaurants, Restaurant Week has grown in popularity over the past two decades. While Restaurant Week varies from place to place, the main concept is that restaurants partner with local tourist organizations or chambers of commerce to promote a week of lunch and/or dinner specials. Other partners may include local businesses, banks, and food vendors. As part of Restaurant Week, businesses offer reduced prices for a limited, prix fixe menu, the idea being that what they lose in check averages they gain in sales volume. Some restaurants report increased volume as high as 40% during Restaurant Week. An ever-popular promotion is two meals for the price of one. To keep food cost under control, keep your two-for-one menu limited to select entrees, or try rotating the menu, offering different dishes each week. Because two-for-one specials are geared toward the budget-minded consumer, avoid offering expensive items, such as lobster or large cuts of beef. Simple menu items, such as roasted chicken, stuffed haddock, meatloaf, and stuffed pork chops all have low food cost and are perennially favorite meals. Everyone likes a deal, and offering coupons for a percent off a meal, a free dessert or other promotion is a great way to reach out to customers. Think beyond the Sunday paper. You can offer coupons on your website, on your Facebook or Twitter page. Specialty dinners, such as dinner theater, fundraisers or a wine tasting are a great way to get extra business through the door in slow times. They work well for both large and small groups and are ideal for those slow weekends in between the busy seasons. Wine tastings are especially popular, because people love good wine and good food, especially when they come together. Similar to a wine tasting, a beer tasting (or beer dinner) is a great way to get customers in during slow seasons at your restaurant. A restaurant beer dinner mixes great beers, generally microbrews or other artisan beers, with a prix fixe menu. Restaurants can sell tickets or take reservations for their beer dinner. Just make sure your kitchen can handle feeding a large crowd all at the same time. Everyone loves a contest and the chance of winning a free gift. Contests are better suited for restaurants with a pub or bar, but there is no rule that you can’t have one in your diner, bistro or café. Contests can range from naming a new dessert dish to winning the weekly football pool. Prizes can be something as simple (and inexpensive) as a gift certificate for a free meal to cold hard cash. Free t-shirts, if you carry them, mugs or other restaurant related retail items also make great promotional gifts.